Toothpaste: It's something most people use every day, but rarely give much thought to — except, perhaps, when choosing from among the dozens of brands that line the drugstore shelf. Is there any difference between them? What's toothpaste made of… and does it really do what it promises on the box? To answer those questions, let's take a closer look inside the tube. Abrasives, which help remove surface deposits and stains from teeth, and make the mechanical action of brushing more effective. They typically include gentle cleaning and polishing agents like hydrated silica or alumina, calcium carbonate or dicalcium phosphate. Detergents, such as sodium lauryl sulfate, which produce the bubbly foam you may notice when brushing vigorously. They help to break up and dissolve substances that would normally be hard to wash away, just like they do in the laundry — but with far milder ingredients. 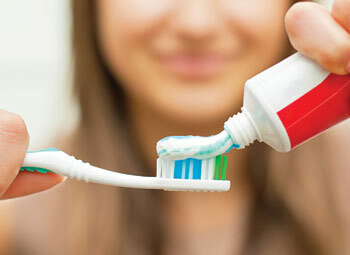 Fluoride, the vital tooth-protective ingredient in toothpaste. Whether it shows up as sodium fluoride, stannous fluoride or sodium monofluorophosphate (MFP), fluoride has been conclusively proven to help strengthen tooth enamel and prevent decay. Besides their active ingredients, most toothpastes also contain preservatives, binders, and flavorings — without which they would tend to dry out, separate… or taste awful. In addition, some specialty toothpastes have additional ingredients for therapeutic purposes. Whitening toothpastes generally contain special abrasives or enzymes designed to help remove stains on the tooth's surfaces. Whether or not they will work for you depends on why your teeth aren't white in the first place: If it's an extrinsic (surface) stain, they can be effective; however, they probably won't help with intrinsic (internal) discoloration, which may require a professional whitening treatment. Toothpastes for sensitive teeth often include ingredients like potassium nitrate or strontium chloride, which can block sensations of pain. Teeth may become sensitive when dentin (the material within the tooth, which is normally covered by enamel, or by the gums) becomes exposed in the mouth. These ingredients can make brushing less painful, but it may take a few weeks until you really notice their effects. What's the best way to choose a toothpaste? The main thing you should look for is the American Dental Association (ADA) Seal of Acceptance on the label. It means that the toothpaste contains fluoride — and that the manufacturer's other claims have been independently tested and verified. But once you've chosen your favorite, keep this bit of dental wisdom in mind: It's not the brush (or the paste) that keeps your mouth healthy — it's the hand that holds it. Don't forget that regular brushing is one of the best ways to prevent tooth decay and maintain good oral hygiene.